There were two “King of Beers” commercials last night, the first one hit home being I am a dog owner, and oddly enough so did the second even though there were no cute pets or “What’s Up?” phone calls. 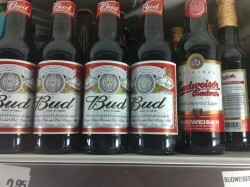 I can easily admit that I am not a “Budweiser drinker” nor am I am drinker of most macro beers. I enjoy a full flavored, robust beer with hops, and where the brewer pushes the creative boundaries of developing unique and good tasting beverage. On Sunday night Budweiser ran a $9 million, 60 second advertisement during the Super Bowl that snubbed craft brewers and the people who drink craft beer. I was not really shocked to see this commercial during the Super Bowl because big business has a way of stepping on the little guy and putting them down even though they usually have a very quality product. What did intrigue me was the after effect this will have on small breweries and the decisions they will be making with representation and their long term goals. The thing is big and small breweries depend on getting their product out on the market and that is where smaller local companies become involved in distribution. These companies take pride in the products they carry and sell to local bars and liquor stores throughout a major region. This example of Budweiser’s folly should also apply to almost all major corporate businesses. I think we can agree that this is just not a smart business practice, it makes us think twice before we will make a purchase or visit certain establishments.